Now is the time for 1099s! Over the past few years, the IRS has taken an aggressive step to ratchet up its ability to enforce business compliance with annual 1099 income reporting regulations. We would like to discuss Form 1099-Misc and these enforcement changes. We will also share the potential consequences for not filing these annual reports and how to stay out of the IRS’s enforcement cross-hairs. If yes, did your business file or will it file form(s) 1099? The taxpayer is then required to check the box “yes” or “no”. This is a response made under penalty of perjury when the taxpayer signs the return. Why is this significant? The 1099 Form series is a major part of the IRS’s Information Reporting Program (including Forms W2 for wages and K-1, which reports partner and S Corporation shareholder income and deductions) which tracks payments made by businesses to other taxpayers. The Information Reporting Program enforces the common taxation rule: The expense of one taxpayer is generally income to another. The addition of these questions is an attempt to close the portion of the $450 billion tax gap (the difference between taxes paid each year and taxes actually owed to the U.S. Treasury) attributable to small businesses’ persistent non-compliance. 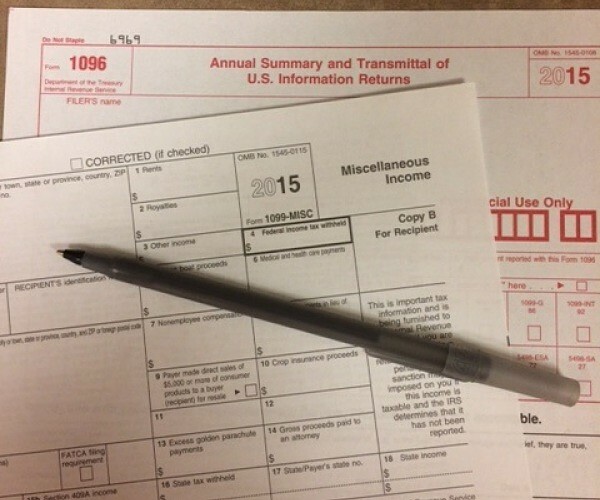 The primary role of Form 1099 is to report to the IRS income taxpayers receive. The IRS enters 1099 data into computers that match it against income reported on taxpayers’ returns. Any income shortfall reported by the taxpayer will automatically generate a letter and/or a bill for tax due, plus penalties and interest. The system is so effective that, if everyone followed the information reporting rules (and deductions did not exist such as with a flat tax), the IRS could simply send taxpayers a bill for their income tax each year. This, in fact, is the procedure for taxpayers who fail to file their income tax returns. Entities Required to File Form 1099-Misc: The Form 1099-Misc reporting rules apply to any business (whether a sole proprietorship, partnership, or corporation) that makes a reportable payment in the course of its trade or business. Personal payments are not reportable. A payer is engaged in a trade or business if the payer operates for gain or profit. Although they do not operate for gain or profit, nonprofit organizations are considered to be engaged in a trade or business and are subject to the Form 1099-Misc reporting requirements. Middlemen: A middleman makes payment on behalf of another person or entity who is the actual source of the funds. Under certain circumstances, the middleman (and not the person who is the actual source of the funds) must report these payments to the payee on Form 1099-Misc. A middleman who performs a management or oversight function in connection with payments or has a significant economic interest in payments made on behalf of another person is the payer that must file Form 1099-Misc. If two or more people meet this requirement for the same payment, the person obligated to file Form 1099-Misc is the person closest in the chain to the payee (unless the parties agree in writing that someone else will make the filing). Payments for services performed for a trade or business by people not treated as its employees. For example: fees to unincorporated subcontractors or directors and golden parachute payments totaling $600 or more in any given year. Rent or royalty payments; prizes and awards that are not for services, such as winnings on TV or radio shows totaling $600 or more, except $10 or more for royalties in any given year. Crop insurance proceeds totaling $600 or more in any given year. Gross proceeds paid to attorneys totaling $600 in any given year. Back-up Withholdings and Form 1099: In order to issue forms 1099, businesses must obtain the Taxpayer Identification Number (TIN) from their service providers. Generally, this is done by providing Form W-9, Request for Taxpayer Identification, to the individual and/or business to which payments will be made. If the service provider fails to provide the requested TIN, the payer may be required to take out “backup withholding” (currently 28 percent) from any payments due the provider, and remit these amounts to the IRS. It is then the responsibility of the payee to file a tax return to claim these withholding payments. The Penalty-Trap: The basic penalty for not filing forms 1099 is generally $250 per unfiled return. This penalty, however, increases to the greater of $500 per return or 10 percent of the total amount that should have been reported if the IRS believes the failure was due to intentionally disregarding 1099 reporting rules. And herein lays the penalty-trap: If a business affirmatively states that they were required to file forms 1099 but fails to do so, they have intentionally disregarded the 1099 reporting rules. If, on the other hand, the business states that they were not required to file Form 1099 and it is later shown that they were, the business has intentionally disregarded the 1099 reporting rules and lied on its tax return. An additional fear which looms among many professionals is that these developments may set the stage for what to date has been a relatively rare penalty: Failure to collect and remit the 28 percent backup withholdings mentioned above. This penalty carries the same weight as the payroll taxes and is equal to the 28 percent tax that should have been withheld. The Take Away: If you have not already done so, make a New Year’s resolution to avoid the penalties listed above by following the Form 1099-Misc reporting rules. The form deadlines are January and February each year. Please remember: This or any article does not constitute or replace the advice of a qualified professional. If you have any questions regarding your taxes or would like assistance in preparing your tax returns, please feel free to call our office at 724-731-0150. For additional tips and related information, be sure to visit our website or give us a call! Best wishes for a joyful and prosperous New Year!